Live Oak, FL--Twenty Fellow Travelers met November 23, 2012, at the Spirit of the Suwannee Music Park for a two-day paddle on the Suwannee. Roy Moye brought Dave, Eric, Brian, Katie, Sarah, and Jacob Moye along with Sarah’s sixth-grade cheerleading companion, Arden Russo. Greg Ferrell brought Jennifer, Katelyn, and Sean. John Williams came from Plains with Leigh Anne and her friend, Dr. Calley Hornbuckle. They spent the night at the Shelfer spread, Shiloh, thus assuring that Art and Janice arrived at the scheduled place and time. Sam Brown came from Thomasville. Donald May, Paul Tolar, Diane Stines (along with Yorkie Ami0, and Charlie Stines drove do wn from Moultrie. The temperature was around forty when the paddlers arrived at the ramp but it warmed up quickly. Edwin McCook was camping at the Spirit of the Suwannee and he came by to wish everyone a good trip. The boats were quickly loaded and all of the vehicles were shuttled to the agricultural inspection station across the road from Gibson Park. The drivers returned in John’s Suburban and it was time to start the grand voyage. Roy soloed and Eric took on Arden and Sarah in the three-seater Penobscot 16. All the other canoes were tandem. John took Donald in his canoe. Donald is having physical problems and is hardly able to paddle but he and John had no visible difficulty. The canoes shoved off just before ten thirty. The weather had improved remarkably and the sunshine was warming everyone. The river was shallow and the bottom could be touched with the paddles most of the time, but it was not so shallow as to force anyone out of the canoes to drag over the sandy bottoms. 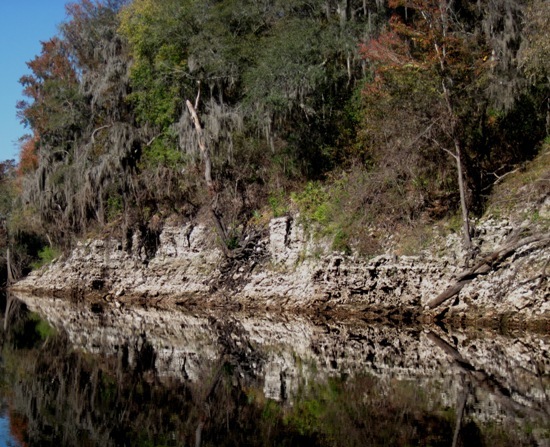 This section of the Suwannee is a winding course with limestone banks and grottos. The autumn color was about as good as it ever gets in north Florida. The maples and sweet gums were particularly pretty as were the bald cypresses which had turned orange for the cool months. There were some wildflowers but very little wildlife other than songbirds and a few turtles. It was time for a stretch break by about twelve fifteen. The sandbar chosen had very steep banks and Diane slipped and fell into the water as she vacated the canoe. It was warm enough that her clothes dried rather quickly. The travelers made this a fairly long and relaxing stop. Art did his usual by not pulling his canoe sufficiently out of the water so it floated away and had to be rescued. Shortly after one the flotilla reached the Florida Boys’ Ranch which was the pre-determined site of the lunch break. The sandbar on the right bank appeared more inviting than the one on the ranch side so everyone disembarked there. The normal cuisine of sardines, sandwiches, Vienna sausages, candy, and fruits was the menu. The two rookies, Arden and Calley, had the opportunity to get to know the veterans. It is less than two miles from the Boys’ Ranch to the Holton Creek Canoe camp so no one was in a hurry to leave. After about an hour of idle time the final leg of Friday’s adventure began. Holton Creek camp was reached about two forty in the afternoon. Charlie had reserved three platforms but all the platforms had other names on them. A conversation with the camp hostess did show that the platforms were reserved for the Fellow Travelers but she had mistakenly put the name Dunn on the shelterIt was then time to carry all the gear and food to the camp. There is a fairly long carry up the bank and stairs, but once the gear was at the top of the stairs the group used the two heavy duty wagons provided by the camp to carry everything to the platforms and the cooking shelter. Mo st of the campers elected to stay on the screened platforms and several did not use tents at all. Diane and Charlie elected to pitch their tent in the woods overlooking the river and one other person camped in the woods. Other visitors came and the campground was at capacity. There were no Dunns to evict the Fellow Travelers, though. Everyone sat underneath the shelter for quite a spell swapping tales and enjoying the comradeship. Supper was served around five. Charlie brought the barbecue from Billy Howell’s My-T-Fine barbecue and it was mighty fine. It was heated by punching holes in aluminum throw-away pans and putting it over heated water. Greg Ferrell brought the buns, the Moyes furnished potato chips, and Diane brought the cole slaw. John baked a pineapple upside-down cake in his Dutch oven and it made a wonderful dessert. After eating and washing the few dishes, the group migrated to a campfire at the circle provided. The weather was getting much cooler but was not unpleasant. Nevertheless, the fire felt inviting. 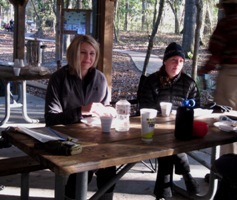 Two park rangers from Crystal River State Park, Martin and Stephanie, joined the Fellow Travelers at the campfire. Eventually everyone went to bed. The temperature probably dropped to the mid-forties but everyone stayed warm. Charlie was the first one out of bed and he fired up the electric coffee for sixty cups of coffee. Sean and Katelyn had been kind enough to carry the urn in their canoe. (Ty paddled the Escape.) It took forever for the coffee to properly brew but most of it was consumed. The group, along with Martin and Stephanie, began eating around eight. The meal was the same as was served on the last swamp trip--bulk sausage fried with peppers and onions and with eggs (furnished by the Shelfers) added then served on flour tortillas. It took three large frying pans for Roy, Paul, and Charlie to cook the feast. Everyone had enough but there were no left-overs. John built a nice campfire and the twenty friends sat around it for quite a while waiting for the temperature to rise. It was just before eleven when the canoeists left Holton Creek bound for Gibson Park. The weather was again beautiful. There was a small spring o n the left hand bank which none of the paddlers had ever noticed on previous trips. It was about thirty minutes below the camp. Most of the paddlers stopped on a sandbar around noon. A few of the boats were so far ahead that they did not participate in this rest stop. Sam and Paul were among those not stopping. They were in the red Tripper. About tweve forty-five they ran upon a log and flipped. They were back in the boat by the time most of the others arrived. Most of their gear was retrieved but Paul lost his tent and Sam dunked his camera. The bridge just above Gibson Park came into view about one-twenty. 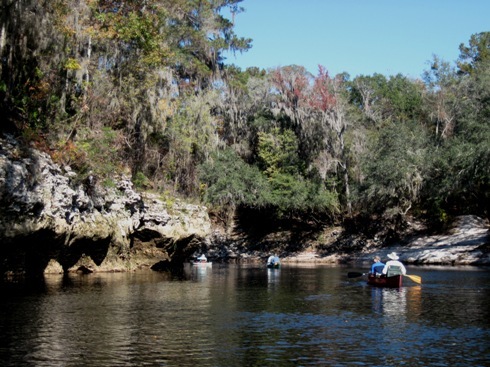 About ten minutes later the group paddled up the spring run to the Alapaha Rise spring. The current to the spring was not as strong as usual so it was a relatively easy side trip. The spring was clearer than it is at times but still was somewhat tannic. It is a pretty setting. The spring appears deep and it is surrounded by very high limestone banks. In warmer weather it invites swimmers but no one dared to do it in November. It is only a short distance to the take-out at Gibson Park. The channel leading to the boat ramp was extremely shallow and required some poling action to reach the take-out. Once there, Sam took John back to the Spirit of the Suwannee to get the Suburban, everyone packed the gear and loaded the boats, and all were headed home before three.